Honey Bee is an upcoming Malayalam film written and directed by Jean Paul Lal, son of actor-director Lal. Jean Paul Lal will make his debut as a director with Honey Bee starring Asif Ali, Bhavana and Baburaj. Deepak Dev tunes music for the lines of Santhosh Varma. 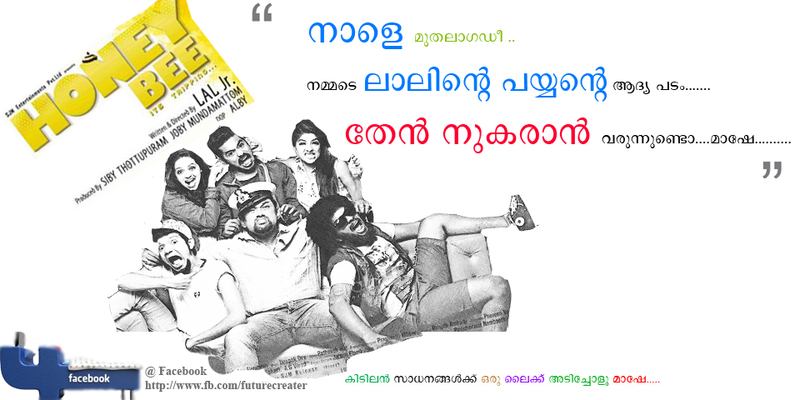 Siby Thottupuram and Joby Mundamattom produce the movie under the banner of SJM Entertainment. Honey Bee started rolling from February 15. It's set against the backdrop of Fort Kochi and deals with friendship and youngsters. Sebastian, Abu, Ambrose Perera, Fernandez Disilva, Angel, and Sara are members of a music band based in Fort Kochi. They share a very deep friendship among them. Sara is the sister of Ambrose. Angel's brothers H C Michael, Martin, Father Cochin, and Antony are nicknamed Punyalanmar by others. Angel is in love with Sebastian. Meanwhile there is a marriage proposal for Angel with SI George. The events that unfold as a result of this proposal weave the plot of the story. Asif Ali, Sreenath Bhasi, Balu, Baburaj, Bhavana, and Archana Kavi don the 6 friends respectively. Punyalan brothers H C Michael, Martin, Father Cochin, and Antony are cast by Lal, Siddique, Suresh Krishna, and Hasim respectively. Rajeev Pillai, Lena, and Vijay Babu also include the cast list.The cinematography is handled by Alby.